Life is a prayer. 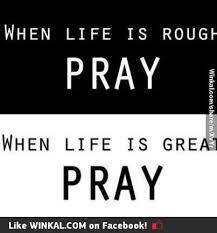 I love this statement; When life is rough pray, when life is great, pray. I have come into the habit of praying every day. Actually, I practice prayer without ceasing. Which means, I am conscious of my thoughts, which are my prayers. Every morning, I wake up and ask God how may I be of service to my highest good. Every evening, I do the same. I feel and have come to know that prayer is not just in times of trouble, but also when times are good. It is raising our consciousness with a deep feeling of gratitude that will connect us to God, and this is where are prayers are answered. Pray every day, even when times are good. Pray is a state of mind. Develop the habit of prayer in your life. Be vigilant of your thoughts and what you are thinking. Your spiritual life will soon be richer, which will manifest into your physical world. So always remember, when life is rough pray, when life is great, pray too! This entry was posted on Wednesday, April 8th, 2015 at 1:12 am and is filed under Art of Thinking. You can follow any responses to this entry through the RSS 2.0 feed. You can leave a response, or trackback from your own site.